Midfielder Dennis signed for the club as an apprentice in 1964 and made his debut later the same year, spending three years at the club before joining his boyhood club Tottenham Hotspur in 1967 for a then record fee of £30,000. 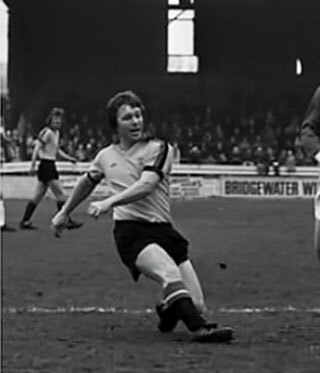 He rejoined Watford from Charlton Athletic in 1972 and spent a further five years at the club before moving into non-league. In total he played more than 250 games for Watford, scoring 38 goals. Watford Legends spoke to Dennis in 2011. Hi Dennis, how did you become a Hornet? When I was 14 or so there was a gentleman called Harry Yeates and he ran a Sunday morning side over at Walthamstow which is where I came from originally and I was playing for them every week. Harry was a part time scout for Watford juniors as well. Ron Burgess was the Watford manager at the time and apparently Ron and Tommy Harmer came over to watch one of the games. Off the back of that I got invited over to train with the juniors at Watford. The training was always on a Tuesday and Thursday evenings in the car park near the ground. It went from there really, I stuck with it and when I turned 15 I was offered apprentice forms which was great. What do you remember of your debut for Watford? I remember Bill McGarry was the manager who gave me my debut, and I had actually played for the youth team in the morning! I thought I was just going to go along with the first team just to help with the kit and what have you. The manager pulled me to one side as I was checking the kit and he said “you best make sure your boots are in there as you are playing today” and I did, I played on the right wing. It was quite memorable and I enjoyed it. I was 16 and a half at the time so I was young enough to just go an enjoy it. So you played two 90 minute games in a day? Yes, like I said I was young back then so I didn’t feel it too much – I might do if I tried to do it now though! You hear players moaning now about the amount of games they have to play so who knows what they would have said if they had to play the number of games we had to play years ago. We played on much heavier pitches back then as well so it was tougher. Did you have any particular players you enjoyed playing alongside at the Vic? Yes I enjoyed playing in the same team as Scully as well as a few others but it is hard to pick them out as everyone brought something to the side and worked hard. Duncan Welbourne was another one that I remember fondly and of course Charlie Livesey was one of the shining lights when he was there as he was the centre forward and got the goals! Cliff Holton was another popular man at the club. Because it was such a good family club though it was a good atmosphere and everyone was on the level. Are you still in touch with any of your ex-teammates? No I’m not unfortunately, because it was so long ago it was harder back then to keep in touch and also I never lived in Watford or really near the area. When I was at Watford I lived in Walthamstow and travelled up every day, it was only when I went to Spurs and got married that we got this house in Cheshunt. I did used to see Bert Slater now and again at different functions and what have you, and now Neil Price is doing all the work with the ex-players and inviting them along to games I have seen a couple of the lads off the back of that which is great. The last time I went there Luther was in the lounge with Keith Mercer – it was a nice crowd. What made you make the move down to Spurs in ’67? I had always been a Spurs supporter to be honest. When I was a boy I used to walk across the marshes to go and watch them. I could have gone there when I was 15 but I chose to sign for Watford instead. Man United, Chelsea and Arsenal all wanted to sign me as well but I thought Watford was where I had the best chance of coming through to the first team and actually making it in the game. It was pretty normal for all the big clubs to come in when you played for England schoolboys which is what I done. You signed for Spurs for £30,000 which was a record fee from Watford at the time. Did moving for such a big fee act as a weight on your shoulders? Not really, no. I’m not the sort of person that would tend to think about that, all I concentrated on was enjoying my football. You played in the ‘Cup Winners Cup’ for Spurs – that must have been a great experience for you. It was indeed. It was a big game but the way the manager spoke to us calmed us all down and so by the time we went out it was just another game of football. By having us all relaxed we enjoyed our football a lot more. You re-signed for Watford from Charlton in 1972, what made you come back? Yes I initially re-joined the club on a month’s loan when George Kirby was the manager. I don’t think Watford wanted to pay a fee at the time so it didn’t happen but then Mike Keen became manager and so I went back. It was a friendly club and they played a big part in my life so I was happy to go back. I think all told I spent nine years at the club. When you left and came back was the club similar to how you left it or had it changed a lot? It was very similar in the way it was run. The staff may have changed a bit but the core of the club was the same. We enjoyed meeting the supporters and so to do that we quite often went in the supporters club, there was always a few characters in there! Quite a few of the fans went away with the club as well so you recognised the faces. I think in those days the players were much closer to the supporters especially compared to now. I think it changed a bit when Graham Taylor took over. He still wanted us to be close to the supporters but it was slightly less so than it was beforehand. Graham Taylor arrived at the club as a rookie manager just as you were getting towards the end of your career. What did you make of him? I wasn’t that impressed to be honest. He didn’t tell me I had been granted a free transfer until quite late on but that was up to him. Normally you would give someone a bit of notice. There was no falling out or anything like that; he just didn’t fancy me which happens as everyone knows. I think in a book he did he said that he didn’t think I was an athlete which is why I didn’t fit. There are no bad feelings though. What did you do with yourself once you hung your boots up? I didn’t stop playing until I was 55 when I had to have a new hip! I did a bit of coaching at Potters Bar and managed Waltham Abbey for a bit to keep myself involved. Workwise I was a general builder and I also did a bit of shop fitting. I still help out a mate of mine with a bit of work now. I don’t think when top level players retire from the game now they will need to continue working once they’ve stopped playing! How do you think you would get on if you were 22/23 now and playing at the top level? I don’t think I would do too bad to be fair, that would be for other people to judge though really! What do you think of modern football? Do you still have a keen interest in it? Yes I go to every Spurs home game as I am still a fan, and also when Neil Price invites me over to Watford I go there for a game as well so yes I am still keen on the game. It is always nice to see a few of the old faces and see a few supporters from back in the day. Since they have started inviting ex-players back I have been to about half a dozen games and it is always nice and the crowd are always decent. Thanks for your time then Dennis, see you at The Vic soon. Any of my granddaughters to keep me company!